TORONTO, ONTARIO--(Marketwire - Oct. 21, 2010) - RONA inc. (TSX:RON), Canada's largest retailer and distributor of hardware, renovation and gardening products, announced today a series of initiatives to reduce the environmental footprint of its stores, after conducting an integrated pilot program launched at the beginning of 2010 at 28 RONA store locations in Ontario. The pilot program focused on two key areas of RONA's environmental footprint reduction strategy: energy efficiency and waste management, including a zero waste initiative. This program was brought to life by employees and the implementation of a new in-store structure based of newly nominated EcoLeaders. Building on the success of this pilot, the integrated program will start being rolled out at RONA stores across Canada during 2011. "We are very proud of the grass-roots involvement of our employees in this pilot program. We're confident that through our EcoLeaders and their in-store committees, strongly supported by store managers, we will be able to reduce our environmental footprint," said RONA President and CEO, Robert Dutton. "Of course, it is important to set goals for diverting waste from landfills and improving our energy efficiency, but the real key to success here is the leadership and mobilization of employees. Mr. Dutton noted that a strong commitment to sustainable development is an integral part of the Company's current strategic plan, called 'The New World'. "I strongly believe that, with initiatives such as those we are announcing today, we are indeed helping build a new world for future generations." RONA EcoLeaders are selected on the basis of their leadership skills and personal engagement towards the environment. Together with their teammates, these employees will be responsible for conceiving, implementing and monitoring the progress of initiatives taken in their particular stores to help reduce the Company's footprint. Top priority will be given to the corporate-wide objectives of cutting down on waste and the amount of energy consumed. The EcoLeader's role also encompasses organization of other activities to raise awareness and promote sustainable development in their stores, in order to make employees better informed with regard to environmental issues — and how they can be part of the solution. RONA EcoLeaders will be provided with on-going training and support designed to keep them abreast of the Company's sustainability related priorities and ensure they are up to date on environmental issues. "The environmental commitments being made by RONA through these initiatives demonstrate their desire to be leaders in their industry" says Jo-Anne St. Godard, Executive Director of the Recycling Council of Ontario. "What's most notable is that they are looking inwards and outwards, committing to reducing their wastes and energy usage in their operations, while providing their customers with opportunities to bring back used products for safe recovery and proper recycling in-store. This comprehensive approach is how they will reach their progressive targets. We applaud their efforts"
The reduction of the environmental footprint program is designed to divert waste material generated by our operations from landfills. This is a crucial consideration in terms of the life-cycle approach that underlies RONA's sustainability platform. Cardboard recovery has been in place at RONA's big-box stores and distribution centres for more than 10 years, and in 2008 we began implementing a program for the recovery of plastic. Thanks to those initiatives, close to 4,500 tons of cardboard and plastic were diverted from landfills in 2009. Our aim now is go a step further by looking into recovering all waste generated by our in-store activities, and then to recycle or dispose of it in an environmentally responsible manner. It is with this objective in mind, that RONA conducted a 'zero waste' initiative in Stockyards and Brampton in Ontario. After just over one month, we can already see the benefits of the program and have decided to expand the initiative to all 28 Ontario stores taking part in the program in 2011. We will also look into implementing zero waste initiatives elsewhere across the country in 2011. In addition to cardboard and plastic, the 'zero waste' program in Ontario includes the recovery of materials such as bottles and cans, paper, wooden skids, scrap wood, landscaping waste, organics, scrap metal, damaged light fixtures and certain types of light bulbs that are not part of the Company's current recovery programs. The objective is to manage all store waste under a single umbrella program. While some recovered materials will be recycled and given a second life, residual waste will be burned at specialized sites and converted into energy. RONA will continue to operate its existing recovery programs that enable consumers to safely dispose of batteries, compact fluorescent light bulbs, power tool accessories and paint. RONA was the first retailer to recover paint, beginning in 1997 in Quebec and 2008 in Ontario. RONA considers climate change as one of the most important environmental issues to manage. Cutting down on energy consumption in our extensive network of stores is a pro-active way of reducing the Company's overall greenhouse gas (GHG) emissions. During the course of the pilot project in Ontario, a number of new energy-reduction initiatives were explored and tested. Some of the more promising ones have been approved for implementation on a larger scale, while others have been selected for further cost-benefit analysis. These energy-efficiency measures include the replacement of older lighting systems by more efficient "T5" fluorescent fixtures, the installation of voltage-harmonizer systems and the retrofitting of advanced HVAC and lighting controls programmed to curb energy use at times when it is not required. To complement investments in energy-saving technology, we will also be working to improve simple operational behaviours such as closing the doors whenever possible to cut down on the loss of heat or cool air, as the case may be. In addition to improving energy efficiency, RONA is looking at new ways of reducing its energy-consumption footprint, including producing renewable energy. One such initiative being considered involves participation in Ontario's Feed-in Tariff (FIT) Program. This project would entail the installation of solar panels on the roofs of three stores in the Greater Toronto area to generate clean energy, which would be fed into the Ontario electrical distribution network. The Company would lease its store roofs in order to enable a specialized company to install and operate a large-scale solar energy generation system. Producing the first electricity is forecasted in 2011. Based on the success of these initiatives, the Company will develop in 2011 an overall program to include specific targets in terms of both waste reduction and energy efficiency. Luc Rodier, Vice President, Operations, for Ontario, said the successful pilot project at RONA stores in that province has not only proven to be good for the environment. "It also brought us financial benefits in terms of cost avoidance and revenues from recovered materials — not to mention a significant boost in employee morale that resulted from empowering our people to make a positive contribution to a cause in which they believe. This program is a great example of an effective triple-bottom-line strategy." RONA is the largest Canadian distributor and retailer of hardware, renovation and gardening products. The company operates a network of nearly 700 corporate, franchise and affiliate stores of various sizes and formats. With close to 30,000 employees working under its family of banners in every region of Canada and more than 16 million square feet of retail space, the RONA store network generates over $6 billion in annual retail sales. For more information, please visit www.rona.ca. 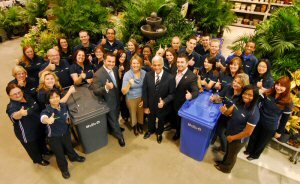 RONA EcoLeaders surrounding Robert Dutton, President and CEO (centre), accompanied with his team, Luc Rodier, Vice President of Operations (second to his right), Anthony Romeo, Store Manager (left) and Jo-Anne St. Godard, Executive Director of Recycling Council of Ontario.